In the middle of our time together in Colorado, we were able to go on a 4 wheeling trip up to the mountains with the whole Langness family. And it was such a nice break from reality and chance to see my mountains! Esha just wanted to make sure Noah knew who was really in charge. I love that silly little grin. Mention the word food and this is what you'll see. There was beauty all around us. It was amazing and we enjoyed it to the fullest! 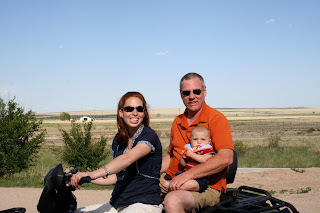 Before I show you the next pic, I thought I'd show you Noah's first ride on a 4 wheeler. He was pretty little and we went pretty slow, but I think it was the beginning of a passion for my son. Because it was all he could talk about before it happened and after 63 miles on our second day, he got off and told us all that we needed to do that again tomorrow! Our cabin for the trip. The perfect retreat from the daily grind. And the grandparents thrived on all the grandchildren time. It was fun to wake up and see Poppi already outside waiting for a chance to hold him. And tell him about the God that made all the creation he saw. We rode on a couple of different passes that took us up to 12,000 feet. Its amazing how much you can see from there. This silly HHR thought it would be a good idea to go up the pass too. They are just about to the top of this 12 thousand foot mountain and how it got that far is beyond me. And why they thought it was a good idea is equally as puzzling. Can't you just see the ear splitting grin under that helmet? Our first day we drove about 20 miles with Uncle Flip, Poppi, Aaron Noah and I. The second day we drove about 63 miles with Uncle Micah, Auntie Chicku, Poppi, Aaron, Noah and I. It was Chicku's first ride and I was so impressed with how well she handled it all. Unfortunately, the whole reason we were driving so far became just out of our reach. The Alpine Tunnel and turntable was something we were all looking forward to seeing, but it would have taken us too long to get there and back so we're saving that for next time. And of course, what's a trip to the mountains without some rock throwing and feet washing in the mountain lake? Noah loved watching Poppi throw all the big rocks into the lake and kept bringing him bigger and bigger rocks. The view from our cabin. We went to a Hot Springs resort and it was so nice after a long day of riding to go soak in the hot springs. We love you all and thanks for all the work that went into making this a great trip!!! The Zoo back home is AMAZING! I know I've said it before when we've gone, but they have so many great animals and how can you not love a zoo built on a mountain?!?! :) Unfortunately, we didn't get to go as often as I had hoped, but there is always next time. We also took a trip with the whole Langness family. What fun to hang out together! Uncle Micah, Auntie Chicku and Esha. We miss you guys already!! Poppi and Noah can have fun anytime, anywhere. We were able to ride the carousel and Noah was in heaven. Breven on the other hand, wasn't so sure we had his best interests in mind. P-Well, yes Noah I do! N-Isn't it cool? Did you know there aren't any tigers at our zoo back home? That or they're ironing out their model poses. 2 cousins, 1 month apart and so very, very different. Cousins Gladys, Jerod, Alyssa, Ciana and Mina came to join us at the zoo. Thanks for hanging out us guys and we were bummed that this was the only time we saw you! Breven wanted to make sure everyone knew there were fish in the bear exibit. Looks like their little restaurant is open for business, so long as you don't mind eating off the floor! Auntie Mel and B hit it off. Isn't she precious!! My new niece, Lily. I'm so glad you're here little one and although you seem to be making sure your parents appreciate sleep, promise me you'll go easy on them-they're still learning. Man, Noah! I just wish you'd show a little happiness about seeing all your family! So many toys...so little time! Isn't this house cool? My dad built it for us when we were growing up and its always a hit with the kids. I love being able to hang out with all of my brothers and their wives. Its probably top on my list of what I miss about Colorado. We love you, Uncle Mikey and Auntie Meghan! And where was Noah when all these pictures were taken? That's right...inside the house. I couldn't seem to get a single shot of him. He's really into turning away from the camera when I come around. Silly boy. Oh, wait! Here's one. Looks like I was able to surprise him!! The boys and I took off from Midway and were supposed to have a short layover in Denver before continuing to the Springs. Unfortunately, our plane was delayed in leaving which meant a delay in getting into Denver. What was once a 40 min. lay over was now a 20 minute layover in which I had to get from gate A2 to gate A62! The first hangup in all of this is that instead of leaving my stroller in Denver after I had gate checked it at Midway, they sent it all the way through to the Springs. So somehow, I had to get me, my heavy bag, 2 boys and 2 backpacks from one end of the airport to the other. YIKES! I stopped just outside A2 to ask if she could call ahead and ask them to hold the flight. She said that she couldn't call ahead, but that I should take a cart and it would get me there in time. I started heading towards A62, hoping I would see one as I went but there weren't any! So I kept walking and at gate A20 I decided to try asking again for them to hold the flight. This time, the flight attendant wouldn't even look at me and told me that she couldn't call ahead and I would just have to run! From the moment we started running at gate A2, Noah was cry/screaming. I have never known the feeling of having so many people staring, but its not a feeling I wish to repeat. Noah wasn't really running when he was crying that hard and after a few gates, he fell down. In my mind, there was only one option...pick up both boys, both back packs, my bag and run. I made it to about gate A35 before I collapsed. I was trying to calm the boys down (who were both screaming at the top of their lungs at this point), catch my breath and pray that God would make those last few minutes stretch to allow me time to make it to the gate. I honestly didn't know what to do. I was just about in tears myself and as I was just about to get back up and try again, a representative of Frontier (the airline we just happened to be flying on) came up to ask what was going on. I quickly explained and he grabbed all three bags, told me to grab the boys and we'd run together. He also just happened to have a radio that he could use to call ahead and ask them to hold the flight! If you look very carefully, we have managed to capture this rare wild creature on camera. And maybe, just maybe, if we're quiet enough, we could get a closer look. Ah, yes. Look at his open posture, a signal of his tolerability, although please be advised that you still don't want to get too comfortable. Wait, Mr. Tiger. We just wanted to observe you in your natural element. Oh, look! He's making the fishy face-an indication of his unusually rare, placid persona. Who knew this pretty little breed liked to hang out, just like us?!?! Where you gonna go next, little fella?